Picking the best of the crop for SAFE’s international markets. Anyone who thinks selling South African fruit to international markets is easy will change their mind after a five-minute conversation with SAFE Exports Marketing and Sales Director, Wibo van den Ende. Wibo is based in the Netherlands to facilitate easier access to buyers in Continental Europe and to enable him to personally oversee the “landing” of SAFE exports. He says delivering the best quality produce, qualifying for critical certification such as Fair Trade, and having great contacts in the business is simply not enough to guarantee sales. This season, he says, has been difficult from a quality and marketing point of view in Europe. The early arrival of table grapes from Brazil and Peru impacted on SAFE deliveries and prices are lower than previous seasons. According to Chantelle Thompson, Logistics Manager of SAFE, SAFE has exported just over 600 000 cartons of which 67% has been sent to UK and EU, 25 % to the Far East and the balance to Middle East. 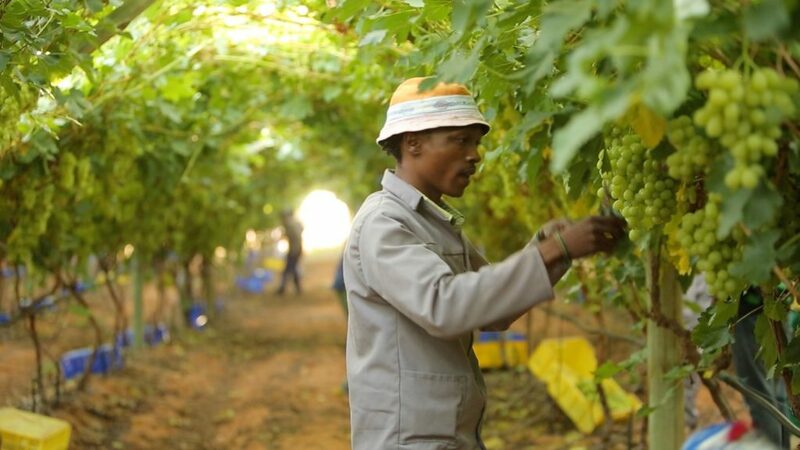 According to Wibo, the good news is that SAFE has received a very positive response, particularly for their mixed seedless grapes that are bulk packed in Holland, as well as their Fair Trade accredited grapes. SAFE’s contract with respected distributor Haluco, says Wibo, is working extremely well – with new efficiencies achieved in delivery to markets. This is critical in terms of keeping the produce as fresh as possible to meet consumer demands – with Jack Salute, Tawny and Ralli varieties selling well “but only when the quality is up to standard,” emphasises Wibo. “Clients are less tolerant of quality deviations such as brix (sugar content) and taste. The fact is that the standards set are extremely high. Nevertheless, in spite of the challenges faced, Wibo anticipates a tough, but he believes, a good year for grape sales. In the Far East Rutger van Wulfen, who manages the marketing and sales to Asia, has found that SAFE’s “L” (large) size grapes are in favour rather than the XL and XXL sizes. “The good thing is that the brix levels are right and taste experience is good. The first fruit is arriving well in supermarkets in Malaysia and Vietnam,” says Rutger. Likewise with Europe, SAFE’s Ralli seedless grapes “are selling very well in China,” according to Rutger. “But the new Green varieties which are crunchy and sweet – such as Sweet Globe, Autumn Crisp and some new Arra’s – will be the new standard in the future,” says Rutger. Rutger says the size of grapes will play an increasingly influential role in sales in 2019. “I am happy that we are strong in all our Far East and Asian markets. We have excellent partners in Asia. My strategy this year is to consolidate our offering and grow with our partners,” concludes Rutger.